The Micropower Circuits Laboratory (MCL) investigates ultra-low-power designs for RF/analog/mixed-signal integrated circuits. Emphasizing both rigorous analysis and intuitive understanding of circuits, MCL’s research seeks innovative designs to set new low-power records. Our research projects include ultra-low-power analog front-end circuits, energy-efficient data converters, and novel signal-acquisition and conditioning circuits for biomedical devices and communication systems. Do you have what it takes to be a great circuit designer? Test your skills here! 1. Calculate the small-signal gain of the amplifiers in a) and b). What are the trade-offs between the two topologies? 2. What is the minimum Iss to start up the oscillator? 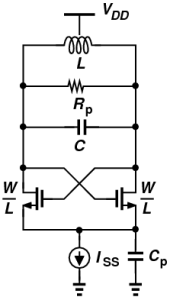 What is the maximum Iss before the transistors go into triode? How does Cp affect the phase noise of the oscillator? 3. Assuming that the capacitors’ sizes are fixed, what is the minimum amplifier open-loop gain (gmR) to achieve 10-bit precision (precision referred to input)? What is the minimum gm to achieve 10-bit settling in T seconds?